CNET UK has tested a compact camera from Sony with an unusual design (see picture). 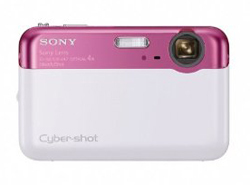 The camera is called Sony Cyber-shot DSC-J10 and comes with plenty of megapixels and a wide zoom lens starting at 26mm. CNET UK ends up giving the Cyber-shot DSC-J10 an average rating with an overall score of 3 out of 5 possible stars. On the positive side the reviewer finds aspects such as the USB-arm, lots of internal storage, an app to share your photos and the design is different. There are some negative points too including poor video quality, it is not possible to add more storage and it does not handle bright photo situations very well. Overall this camera is a pretty average performer, but if you are looking for a camera with lots of internal memory and an USB-arm this might be your choice. Read the full review of the Sony Cyber-shot DSC-J10 wide angle digital camera here.